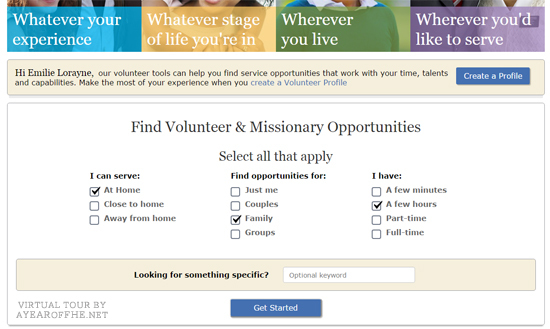 Today I wanted to guide you through the new LDS Service website at VOLUNTEER.LDS.ORG. 01. First log in to your account at LDS.org. You are using the log in you always use to access your Ward List, etc. 02. 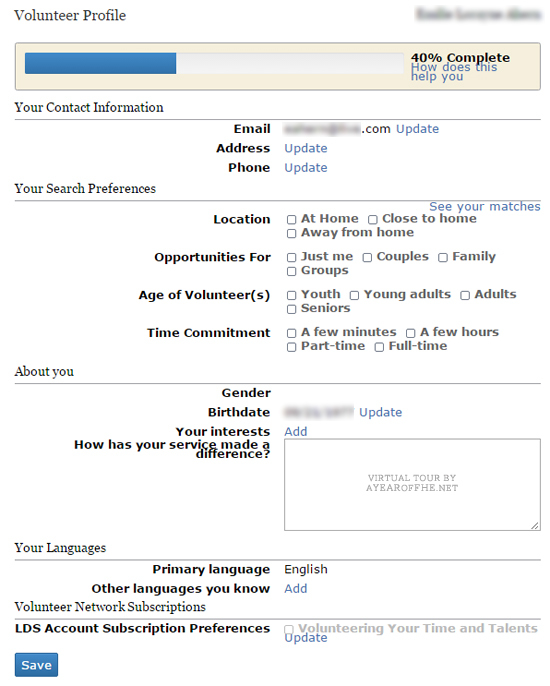 Next, visit VOLUNTEER.LDS.ORG. You'll see this landing page come up. If you're signed in correctly you'll also see your name in this text box. The very next option below this header allows you to select certain criteria for your service. You'll notice I selected "At Home", "Family", and "A few hours". Next this list popped up! I'm pretty impressed so far. Here is the first few items on the list. 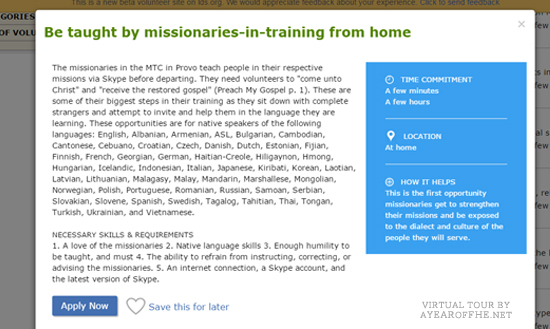 One of the options that popped up was Being Taught by Missionaries-In-Training from Home". I clicked on the title and this window popped up with thorough information on what would be required, how you can most help, and exactly what was needed. Can you imagine what a great learning opportunity this would be for kids and teens? They would get to see real missionaries as they practice teaching the gospel. I just think it would be really cool. As I was preparing for a mission I didn't have a very realistic grasp of exactly how missionaries would teach. This would be so awesome to do with a teen preparing for a mission. - Donating photos and videos for church use. - Blogging about simple gospel topics. - Uploading graphic designs for the church to use. - Adding reviews of your LDS chapel to Google Search. 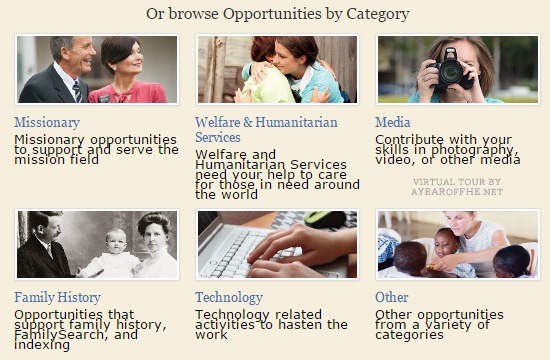 On the dashboard page there is also an option to search service opportunities by category. You will also be asked to fill out a Volunteer Profile. 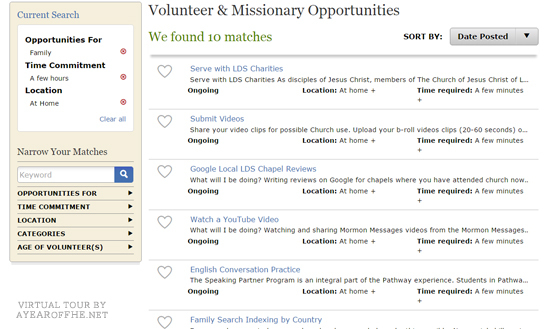 The page looks like this and some info will already be filled out for you based on the info in your main lds.org account. 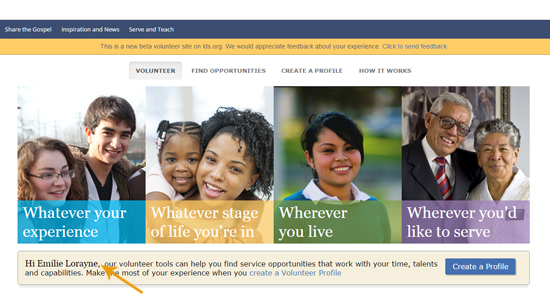 it seems like this is meant to streamline the process while applying for service opportunities. I think this site looks pretty amazing. There are so many easy ways to serve. This would be a great opportunity to do this Summer with your kids to help them remember to serve others! I love how easy it is to find service opportunities. This has been a really great addition to LDS.org. Thanks for sharing. What an AWESOME way to get more people to serve those in their own communities! Thanks for such an informative post!